Kelly Serfas, a Certified Veterinary Technician in Bethlehem, PA, contributed to this post. 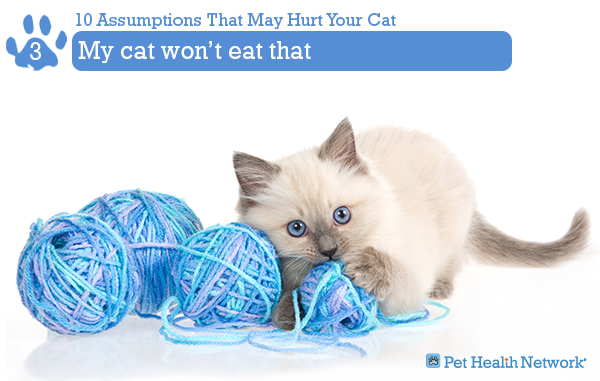 As a veterinarian, I commonly come across 10 dangerous assumptions held by feline caretakers. 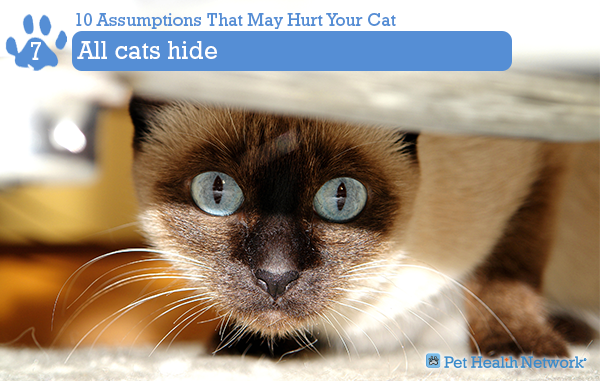 It’s time to put an end to these rumors that may negatively impact feline health. 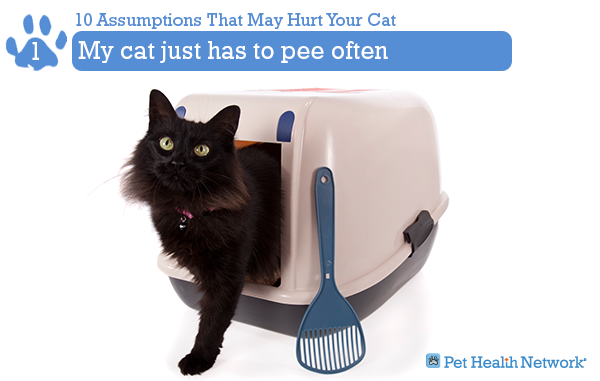 A common feline emergency is urinary or urethral blockage. It is mostly seen in male cats, and occasionally in female cats. A cat can become "blocked" by a build-up of crystals or mucus that acts as a plug. Without emergency intervention, the kidneys can fail and the cat could die. Obesity is a major health issue in itself, causing joint problems and decreased activity. It can also lead to a number of other illnesses including diabetes. 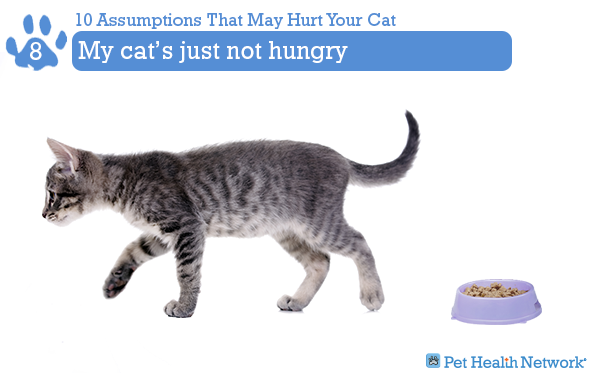 Cats don't seem to be as likely to eat something they shouldn't as dogs, but you would be surprised to know the vast array of items we remove from cats’ stomach and intestines: plants, hair, ribbon, rubber bands, hair ties, plastic or rubber toys, string and so on. Skin masses are less common in cats than in dogs. They may be benign (non-cancerous) or malignant (cancerous). In cats, many skin masses are malignant, so early diagnosis is critical. 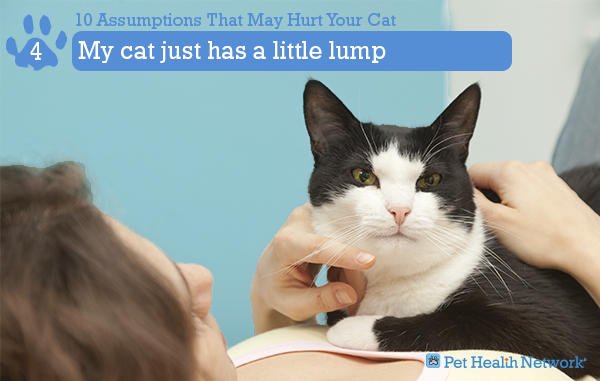 If you feel a lump on or under your cat’s skin, please ask your veterinarian what you should do about it. It’s prudent to have the mass removed and biopsied. Cats are notoriously poor drinkers. In part because of it, constipation can occur, which is uncomfortable if not painful. Medications and a diet change may help, but in extreme situations (megacolon), the colon should be removed surgically. 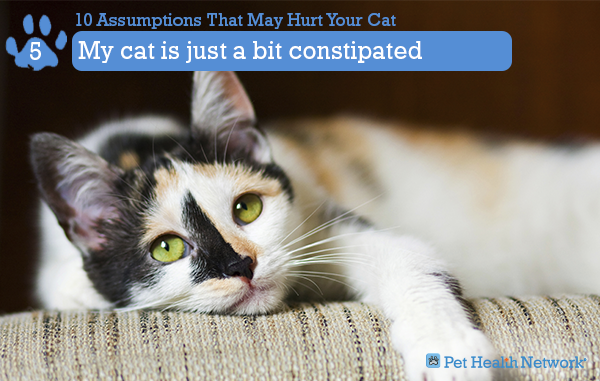 Most cat owners believe that it is normal for a cat to vomit regularly, even if it’s just a hairball. Yet vomiting weekly or every other week is not normal. 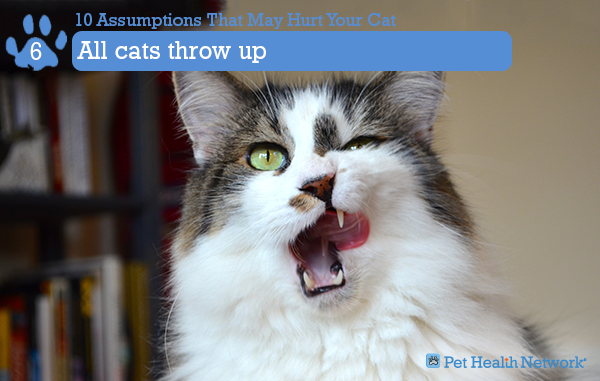 Recent research, conducted by the Alamo Feline Health Center, shows that the cause of vomiting is often serious. The authors of the research strongly recommend taking surgical biopsies of the intestine to figure out the true cause of the vomiting. Cats that do not feel well, have an instinct to hide. It may be in their favorite hiding spot, or in a totally unusual place. They may not even show up for feeding times, despite your best efforts. If you ever observe this behavior, please take it seriously and take your cat to your family veterinarian. Loss of appetite is a vague sign that goes along with many health issues, some of which include pain, urinary blockage, constipation, tumors and much more. Left untreated, especially in an overweight or obese cat, this can lead to a deadly condition called hepatic lipidosis. 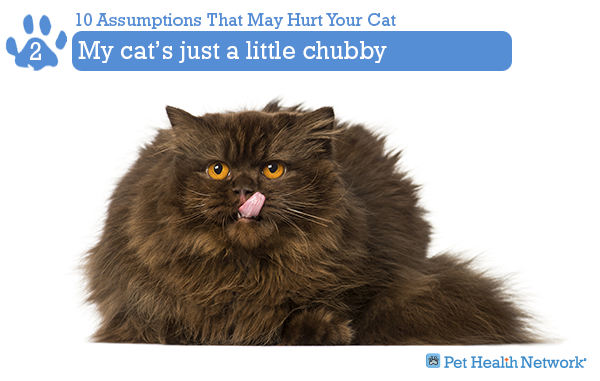 This is basically “fatty liver,” which can make a cat even sicker. No matter what some over-the-counter flea or tick medications claim, some are not safe at all. I recommended only buying flea and tick products from your veterinarian. Be sure to ask for the correct dosage and how to apply it. 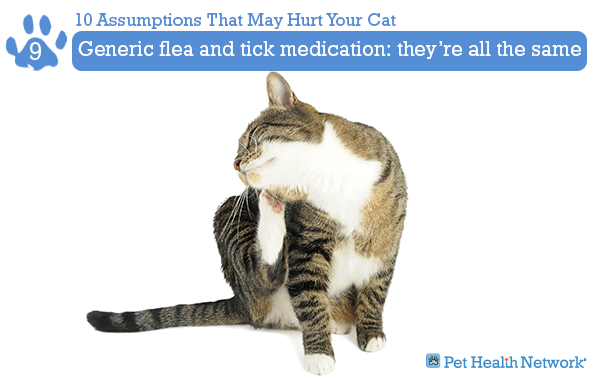 Never apply flea or tick medications labeled for dogs on your cat! 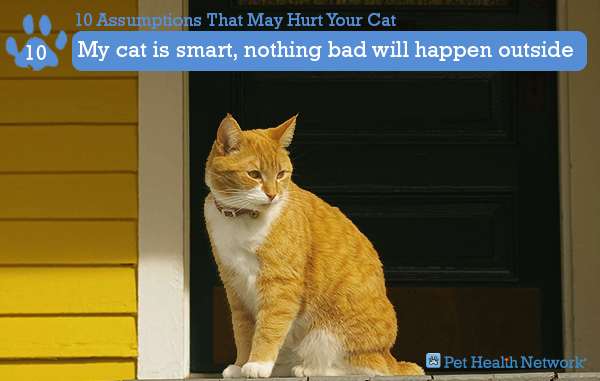 Cats who roam outside can run into a multitude of dangers, even if they are only allowed in your backyard! There are a surprisingly large number of plants which are lovely to look at, but highly toxic if your cat decides to "take a nibble." Cats who are allowed outdoors are also at risk when other animals come in contact with them. This contact risks bite wounds and exposure to diseases such as feline infectious virus, feline leukemia and rabies. Other common situations include falling and breaking a leg, as well as getting hit by a car.